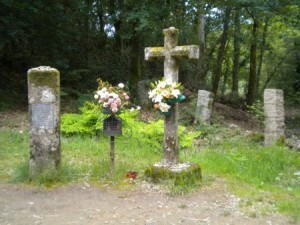 There are many pilgrim paths to Santiago but there is none more soulful and significant than the Portuguese Way. This is the path that is intimately connected with the life and ministry of St. James as well as his death and burial. It was on this route that he first preached in Iberia and later his body made its last journey. This walk is more than enough to qualify for the ‘Compostela’ & the ‘Pilgrims passport’ can be obtained at Tui Cathedral when you arrive. Day 1. Arrival in the historic town of Tui on the Portuguese / Spanish border. Overnight Tui. Day 2. Tui to Porrino (16km) most of this first stage is woodland paths that follow the lovely Louro river valley, then along the N550 to the historical centre of Porrino. Overnight Porrino. Day 3. Porrino to Arcade (22km) you climb up through mixed forest to Monte Cornedo & the Chans das Pipas plateau before dropping down to the town of Redondela. From here you pass through tiny hamlets to reach Arcade. Overnight Arcade. Day 4. Arcade to Pontevedra (12.5km) you start the day by walking over the beautiful old bridge at Pontesampaio phentermine med then a short uphill stretch following ancient stone paths before dropping down to the provincial capital of Pontevedra. Overnight Pontevedra. Day 5. Pontevedra to Caldas de Reis (23.8km) most of this stage is through woodland and countryside along gentle river valleys with virtually no climbing. Overnight Caldas de Reis. Day 6. Caldas de Reis to Padron (19.2km) this is a beautiful walk through the Bermana river valley before dropping down into the Valga valley, one short climb. Overnight Padron. Day 7. Padron to Santiago de Compostela (25.6km) the final day takes us through pine, oak and eucalyptus wood before climbing up to reach Santiago. Overnight Santiago. All hotels are comfortable 3 & 4* rating with good bathrooms and plenty of hot water!